When it comes to asbestos, you definitely don’t want to mess around. Attempting to handle your asbestos removal project yourself can lead to disastrous results – in particular, further contamination and exposure. Prevent these terrible outcomes from happening by calling Pomona’s asbestos removal experts, H2 Environmental Consulting Services, to handle all your asbestos removal needs. You might be wondering, why does asbestos need to be removed at all? Actually, it’s essential that it’s removed because if the asbestos fibers are disturbed – perhaps you begin a construction project or start rummaging around in your attic where asbestos is present – then they could be inhaled. Exposure to asbestos has been proven to lead to very serious diseases, including cancers. Perhaps you’re not sure whether your property has asbestos in it or not. No problem! Call H2 Environmental Consulting Services at (800) 524-3578 and we’ll conduct an expert evaluation of your property. Using the most advanced technology and techniques, we’ll check for all kinds of commonly found contaminants, including asbestos, lead, mold, and fungus. Then we’ll give you a thorough report of our findings, and answer any questions you may have. We’ll also provide you with a free estimate of all remediation services so you know what to expect from H2 Environmental Consulting Services. 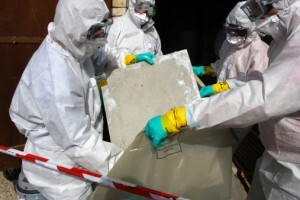 Then when you’re ready to have us remove the asbestos from your property, we will come in and perfectly prepare it so there’s absolutely no risk of further contamination. Using top-of-the-line tools and optimal techniques, we’ll eradicate asbestos from your property. We’ll also safely dispose of anything that’s been contaminated by asbestos according to state and federal laws. You’ll be able to breathe easier right away! Why go with H2 Environmental Consulting Services? H2 Environmental Consulting Services is a local company that’s based right next door to Pomona, in Chino. We’ve been specializing in asbestos removal for over 24 years, so you can definitely trust us to efficiently, safely, and thoroughly take care of your asbestos removal needs in Pomona or anywhere else in Southern California. You have various options for asbestos removal services in Pomona and the surrounding areas, but we’re confident that if you want the best asbestos removal service, you’ll definitely choose H2 Environmental Consulting Services. To schedule your environmental evaluation and asbestos removal now, simply give us a call at (800) 524-3578 or email CustomerService@H2Env.com. Also if you have any questions or concerns about what we do at H2 Environmental Consulting Services and how you can make sure where you live and work is 100% safe, feel free to ask anytime. Our staff is committed to making Pomona and Southern California free of all contamination, including asbestos.